The success of a repair or rehabilitation project depends on the specific plans designed for it. 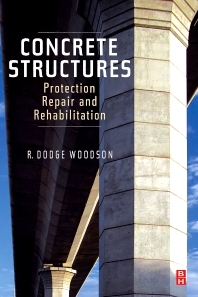 Concrete Structures: Protection, Repair and Rehabilitation provides guidance on evaluating the condition of the concrete in a structure, relating the condition of the concrete to the underlying cause or causes of that condition, selecting an appropriate repair material and method for any deficiency found, and using the selected materials and methods to repair or rehabilitate the structure. Guidance is also provided for engineers focused on maintaining concrete and preparing concrete investigation reports for repair and rehabilitation projects. Considerations for certain specialized types of rehabilitation projects are also given. In addition, the author translates cryptic codes, theories, specifications and details into easy to understand language. Tip boxes are used to highlight key elements of the text as well as code considerations based on the International Code Council or International Building Codes. The book contains various worked out examples and equations. Case Studies will be included along with diagrams and schematics to provide visuals to the book.